Don’t you just love when a product completely takes you by surprise? The Gel Bottle’s Builder in a Bottle did just this to me. I didn’t know what to expect to be honest. Let’s just say I was pleasantly surprised from word GO!! So what is this product all about? Well. Basically, it is as it says. 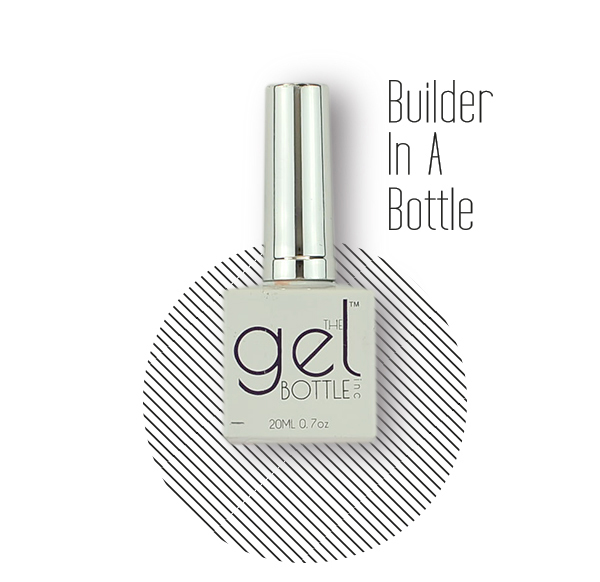 A soak off builder gel but in a bottle. It can be used on natural nails as an overlay or on extensions as a builder gel. This give amazing strength and durability to the nail. It can be used over tips or to sculpt with forms. The difference with this product and a normal gel product is the fact that it is applied just like a normal gel polish, with a normal nail polish type brush. The only difference is you apply this one a bit thicker to build up the stress point. Honestly, if you do your own nails you need to check this product out. I now only need to do my nails every three weeks instead of every week. This product gives my nails so much strength and durability. It is now a must have for me. The application of the product is a doddle too. You only need to prep the nail with acetone, no dehydrators, no primers! For best results and to avoid the heat spike I tend to apply a very thin coat (almost like a base coat) first, cure this and then go in with my builder layer. When applying on shorter nails you don’t need a really thick layer. As the nail gets longer you would need to apply more product particularly at the Apex (Stress Point). As long as your application is clean and you do not flood the cuticles you will not have any issues with lifting. The nails are perfect right up to the time when a refill is needed. I genuinely cannot fault this product. It comes in a large 20ml bottle. Compared to other builder gels which come in a 15ml and 30ml pot this one is reasonably priced in my opinion. For pricing details and to purchase you can visit the Gel Bottle Ireland’s Website. Breda is the Irish distributor. She is very helpful and friendly. Be sure to make contact if you have any questions for her. The only thing I am not a huge fan of when it comes to this brand is the fact that the instructions are not on the product. When you buy a product the instructions are sent to you by email however it would be a nice added touch to have these on the bottle. They have a huge range of gel polishes available and heads up, their top coat is one of the best I have tried to date!! The Gel Bottle Builder in a Bottle cures under UV (2 mins) and LED (30secs). It is soak off and will soak off without any problems in 15 to 20 minutes. I have shade 17 but there are lots of other shades to choose from. Personally, I prefer this for overlays on natural nails and I am obsessed with it for doing my own nail with. I don’t tend to opt for this as much with extensions but I have used it and have had no issues. I cannot give this product anything but a 5 heart rating, it deserves even more in my opinion. Have you tried this product? Please don’t forget to RATE this below and leave some feedback as it is great to hear what other people think of this product!! Definitely going to try this. I only do gel polish on natural nails but have a lot of clients with weak & brittle nails. Hi Anita, as this is a soak off gel, can it be filed off as well? For example say if you were doing a re-fill for a client? Hi. Wondering if you can help, I’ve been scouring the web to find out if any additional products are needed with the Gel Bottle? Will a file and acetone be enough to remove it or will I need more? Thank you so much. And will I need any other things for application or will acetone and a file do for that too? Hi Anita i’m allergic to acetone can i use rubbing alcohol? Wondering what the time scale of this product is before lifting or coming off. Find it hard to get a good builder gel that stays on longer than 2 weeks! Just ordered the set to try it out !